There’s a huge festival coming up this weekend in California. That’s not breaking news, since California may hold more festivals than any other place on earth. It throws them to honor artichokes, garlic, butter and eggs, olives, mustard, ducks, numerous ancestries, frogs that jump competitively, and swallows that fly back to an old mission from South America en masse each Spring. 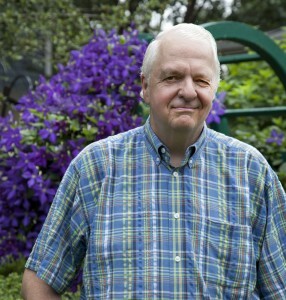 There’s even a “Fungi Festival” to celebrate edible mushrooms. The festival will include artists’ exhibitions, vintage car and motorcycle displays, a watercraft parade beneath the soaring structure, the predictable assortment of music and dance, and, no doubt, sales of enough bridge trinkets to clog the passageway if everyone decided to discard them at once. The reference to “Diamond Over the Rough” in the headline is meant to be clever. Emphasis on “meant to be.” The 75th is traditionally the diamond anniversary, and the “rough” refers to the churning, fast-moving water beneath the bridge, which links San Francisco Bay to the Pacific Ocean. 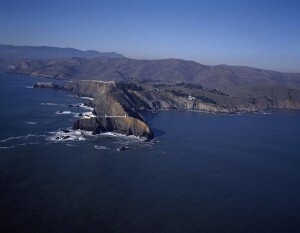 The strait was named by American explorer John C. Frémont in 1848. He said it reminded him of Istanbul’s Golden Horn Harbor. How rough are its waters? 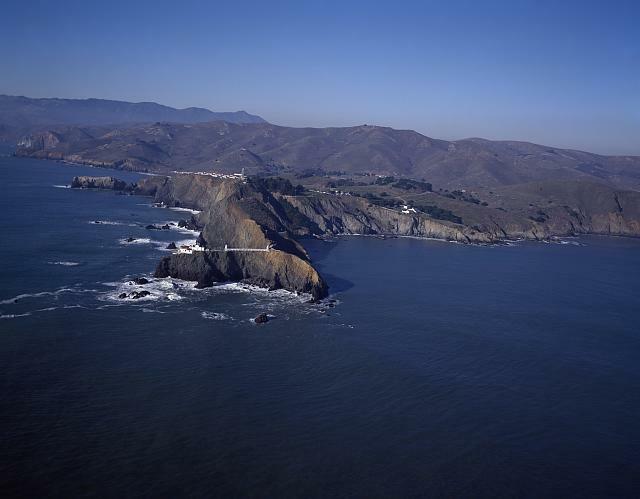 Ask the half-dozen men who tried to swim it — or traverse it on a makeshift raft made of old raincoats — after escaping from the notorious federal prison on Alcatraz Island, which sits just four kilometers east of the strait. Good luck finding them. Those few who made it as far as the cold, swift currents of the Golden Gate Strait were presumed drowned. But legends that two or three of the escapees survived were powerful enough that a movie, cleverly titled, “Escape from Alcatraz,” was made about them. My reference to other festivals’ “paling” in comparison to the big weekend bash is a nod to the legendary “international orange” color of the great bridge’s paint, which was specifically formulated to combat the corroding properties of the salty fog that gathers so artistically thereabouts. The legions of environmentalists in the San Francisco area would be dismayed to learn that until recently the prominent rust-fighting ingredient in this and other outdoor paint was lead. The bridge is re-painted almost continuously, though I figure the painters will be taking this weekend off. When the Golden Gate Bridge was finished in 1937, a trip up the California coastline on U.S. Highway 1 no longer required a ferry crossing from Fisherman’s Wharf to the Marin County shore. The bridge, which can sway almost eight meters in a gale — of which there are many — and will rise a couple of meters due to expansion on a hot day and drop three on a cold one, is a triumph of modern engineering, especially considering those swift currents in the 60-meter-deep water below. To understand the bridge’s amazing engineering, picture an incredibly sturdy hammock, suspended between two massive support towers. 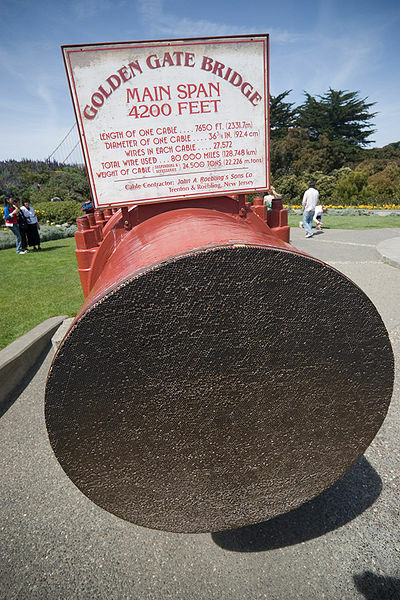 One-meter-thick cables — each a bundle of more than 27,000 wires – drape over the bridge’s towers, then stretch back to bedrock in San Francisco and the opposite shore. Each cable began with a single wire across which a spinning shuttle wheel rode back and forth, and back and forth, twisting together thousands more wires. The whole thing is a wonder of the modern world, if you ask me — or the American Society of Civil Engineers. The finished cables support the “hammock” — the bridge’s rigid road surface and railings — suspended below. 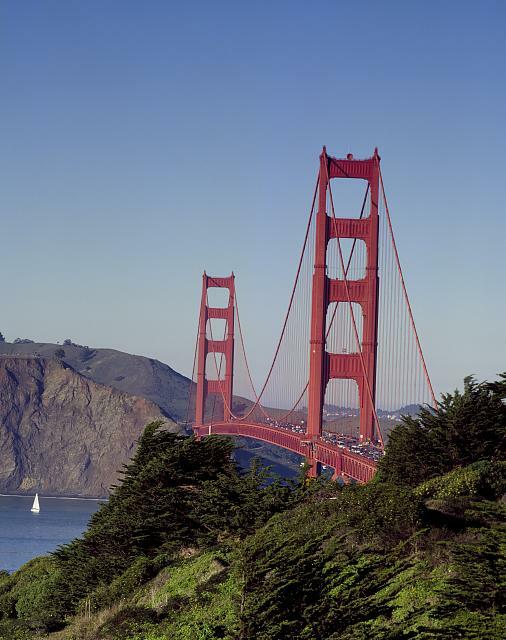 More notoriously, the Golden Gate Bridge has been the site of an estimated 1,200 suicides. After all, how does one suicide-proof a bridge that’s 2½ kilometers (almost 9,000 feet) long? 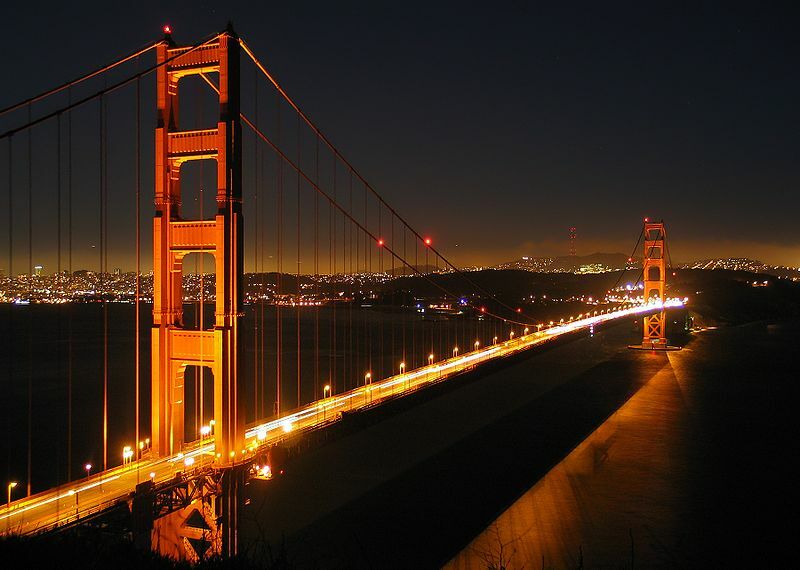 In 2008, the Times of London reported that the Golden Gate Bridge is, in fact, the most popular place in the world to take one’s life — if “popular” fits such unfortunate plunges to the frigid waters 75 meters below. The heaviest load the bridge has carried was the weight of an estimated 300,000 people who marked its 50th anniversary by walking across on May 24, 1987. This caused the center span of the bridge to flatten out under the weight, an alarming development that explains why there will be no such mass crossing permitted for the 75th. Singly, about 2 billion vehicles are estimated to have traversed it since it opened. 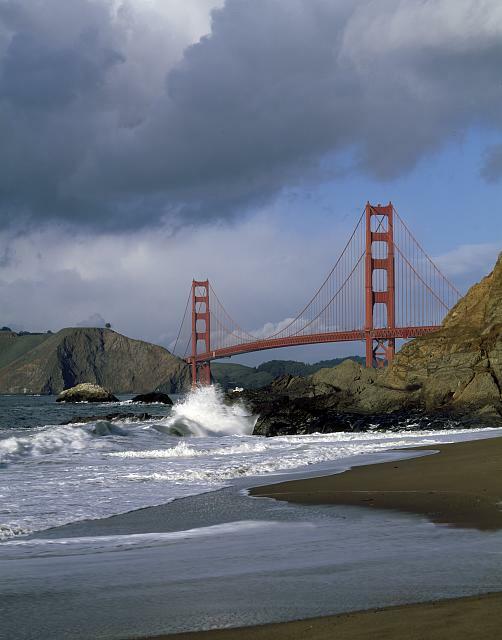 The deadly 7.1-magnitude Loma Prieta earthquake of 1989 severely damaged the San Francisco-Oakland Bay Bridge around the bend on the San Francisco peninsula, but the Golden Gate Bridge came through nearly unscathed. Still, authorities thought it prudent to undertake a three-part seismic retrofit, which began in 2002. The retrofit — too complex to summarize here, not that I could very well — included an added support tower. The fellow responsible for this remarkable structure was Joseph Strauss, a dreamy engineer and poet whose previous specialties had been drawbridges and railroad spans. Included among the latter was an 89-km bridge across the Bering Strait. That’s right: one bridge almost 90 kilometers long! Strauss was encouraged to design a suspension bridge across the roiling Golden Gate strait, but he faced significant opposition. From ferry operators, naturally, but also from the U.S. War Department, which staffed a fortress — Fort Point — on the city side of the strait and worried that a bridge would impede shipping traffic. That fort is still in place, tucked under the southern edge of the bridge. 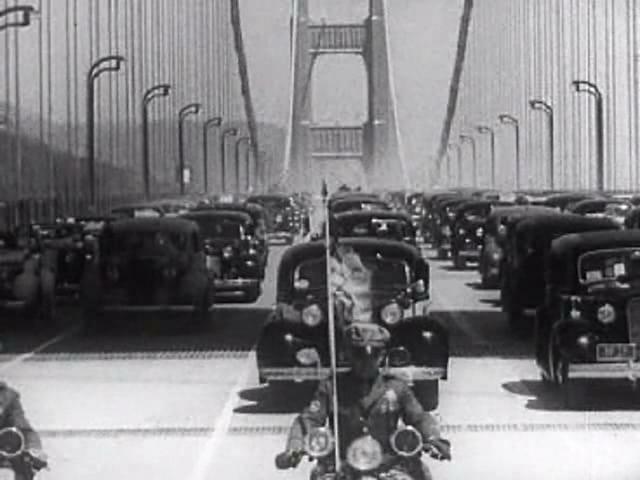 But Strauss got strong support from the emerging cadre of automobile enthusiasts, the auto industry, business leaders in San Francisco, and folks on the northern side of the strait who had grown weary of waiting for ferries to head over to San Francisco for a night on the town. Strauss, though, had little to do with the artistic look of the structure, including its Art Deco streetlights, railing, and pedestrian walkway. Or its color, first thought to be gaudy but now adored as iconic. Locals persuaded the bridge authority to snazz up the bridge in vivid orange in preference to the standard dull gray or the Navy’s preferred black with yellow stripes. An official song, “There’s a Silver Moon on the Golden Gate,” commemorated the event. It’s fair to say that this tune doesn’t rival “I Left My Heart in San Francisco,” three quarters of a century later. Strauss, the poetic engineer, even wrote a ditty for the occasion. Called “The Mighty Task is Done,” it’s affixed somewhere on the span. When it was completed, the Golden Gate Bridge became the longest suspension bridge main span in the world. That lasted until New York’s Verrazano-Narrows Bridge opened in 1964. And seven or eight other bridges have since surpassed them both. My favorite additional Golden Gate Bridge detail, noted here for bridge buffs: It’s held together by 1,200,000 rivets. I can’t for the life of me imagine who did the counting. It certainly makes beautiful music visually. 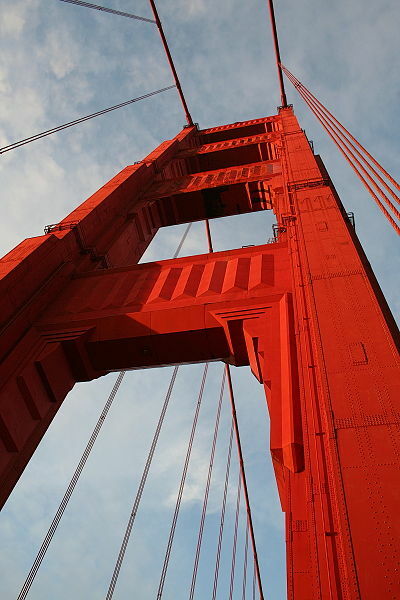 My photographer-wife Carol M. Highsmith — whose images, as frequent readers know, grace the pixel space next to these ramblings today and often — is drawn, almost magnetically, to the bridge every time we visit San Francisco. Hammock. A bed — sometimes one that swings — made of canvas or cloth mesh that is suspended from fixed structures by cords. Retrofit. To add something not included when an item or structure was first built. Happy 75th Birthday, Golden Gate Bridge! The bridge authority wants to spend 43 million on a net. That’s $30,000 for each of the 1500 suicides since the bridge opened. Money better spent on mental health, even endowing a clinic on the bridge at both ends. Or provide suicide prevention services to the city alone. Whose to say they won’t jump to the net and then over the net to complete the job!